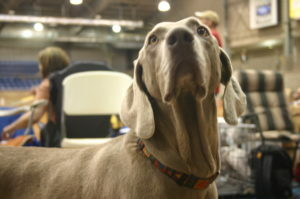 The breed of the week is the Weimaraner, a medium sized hunting dog. Some of y’all might know this breed via Goose, or because of Sesame Street. He said ironically. I think this took place at Hogwart’s. Y’all didn’t know there were Weims at Hogwart’s? Me either. Libby is the five month old Weimaraner we highlighted yesterday. She likes long walks on the beach, playing with five year boys, and Big Paw Jerky from Jones Natural Chews. 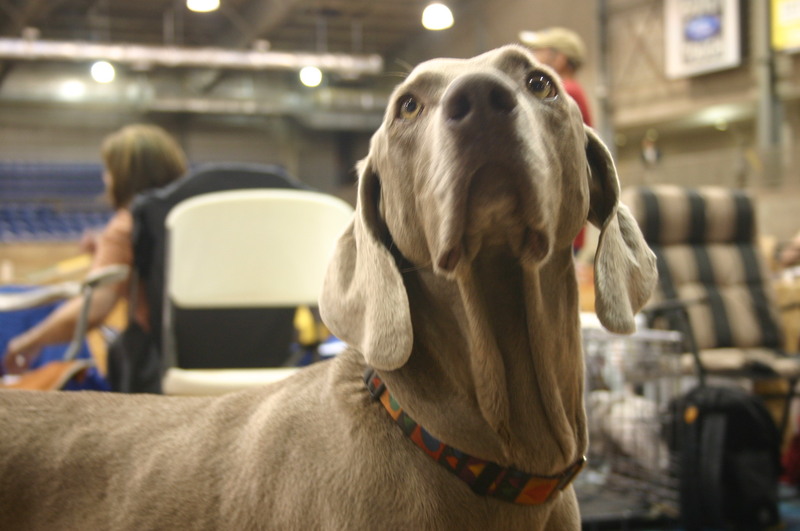 The one Weimaraner I’ve known in person was an agility dog, not a hunter. The Weim, though, is believed to be a direct descendant of the Bloodhound.They’re used for bird hunting now, and are good, strong swimmers. Did you know that they have webbed toes? 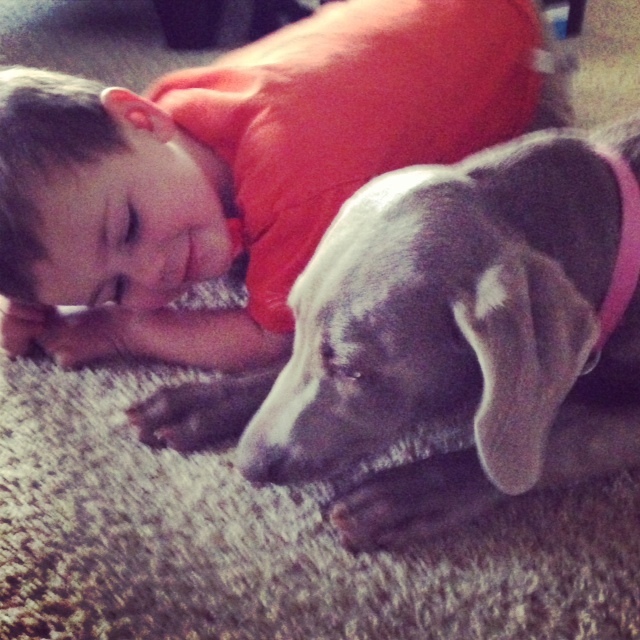 Similar to the Bloodhound, the Weimaraner typically makes a good family dog. Wynstan is a little boy. Libby is an active pup. The two make the perfect pair. At just five months, Libby will already sit when Wynstan tells her to. 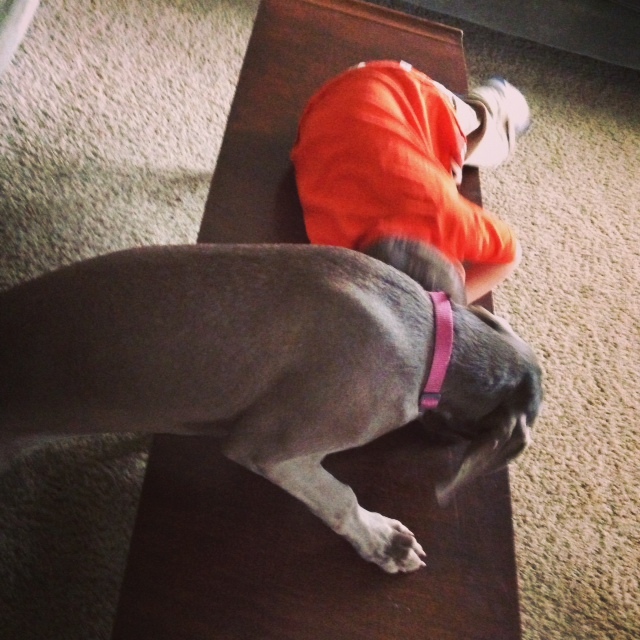 She’ll also give him an excuse to climb onto the coffee table with her. The Weimaraner was bred for nobility a few hundred years ago. Their stance, their personality, are regal. This is, I think, the first breed I’ve come across which is bred in only one color. No spots. No other colors. Only grey. And though there’s a photo online of a long-haired Weimaraner, that gene is recessive and they’re not often seen. A long-haired Weim will also have its natural tail (Weimaraner tails are docked at birth, growing to only about six inches long in adulthood). Winston’s an old man, but he can still run – this is the agility Weimaraner I knew a few years back. When I say that this is the perfect family dog, I mean families with small, tough children who are home, or for families who are physically active. The Weimaraner has lots of energy. It really is the perfect dog for my friend and her boys. This is a pack of boys. They’re Libby’s pack. 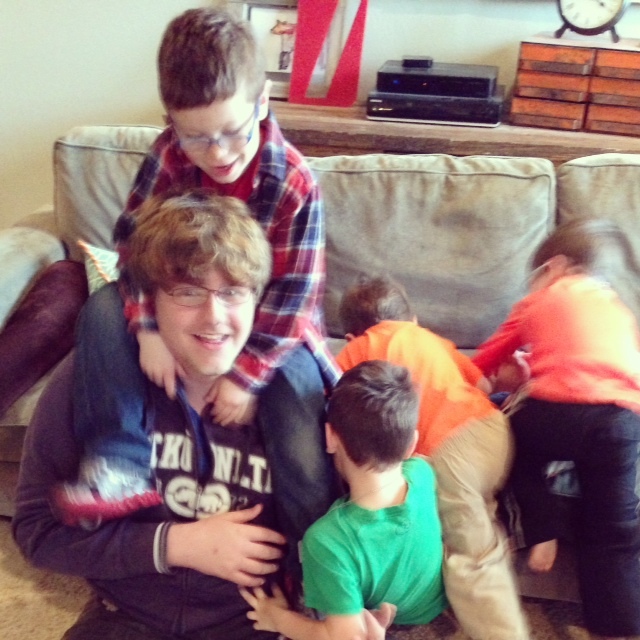 Right now, they’ve hunted my son and are taking him down as a pack. Let’s walk through the pros and cons of owning a Weimaraner (partly based on this highly informative site). Happy, intelligent, cheerful dogs – with the happiness comes unbounded energy! Short coat, low maintenance – I think this is one of my favorite things about this breed, the lack of hair all over the house! Seriously? That’s all the cons for this dog? Why doesn’t everyone own a Weimaraner? They truly are very energetic, meaning people like me, who sit on the couch a lot, would fall over dead with a heart attack trying to keep up. Or, I’d have to go for long walks, which would be very good for me. Hmm. What kinds of Jones Natural Chews would Weimaraners like? Well, Libby loves the Big Paw Jerky (most dogs do), but I know she’d also love the Stuffed Windees we’re currently giving away. Your dog would, too! So do yourself and your dog a favor and click this sentence, then follow the instructions in the new post which will open to enter our current giveaway. Treat your dog to happiness. And let me know if you decide the Weimaraner is right for you!